I was sitting in Amy Campanini’s office at Palmetto Animal League when the call came in. Amy is PAL’s president, and the caller on the other end was a worker at a Virginia animal shelter. The news was hard to take. Hope, a sweet dog adopted four years ago from PAL’s Adoption Center in Okatie, had been dropped off by her owners. Their reason for giving up Hope: new baby, new job, no room for Hope in their lives. As a new mother myself, I am the first one to understand how difficult it can be to juggle a new baby and a new job along with beloved pets and everything else life throws your way. What I don’t understand is taking your dog of four years to an animal shelter, knowing full well what could happen if a new family isn’t found in time. We are lucky here in the Lowcountry, because Palmetto Animal League extends a lifetime commitment to adopters and the pets they adopt. If at any time the adopter can no longer care for the pet, PAL will accept the animal back and work to find him or her a new home. That’s why the call notifying us that Hope had been surrendered to a different shelter was so hard to understand. Thankfully, all pets adopted from PAL are microchipped, so the Virginia shelter quickly realized that Hope’s journey had begun in our adoption center. 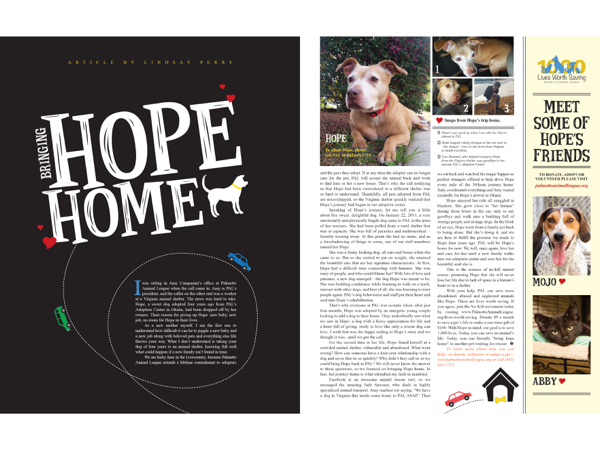 Speaking of Hope’s journey, let me tell you a little about this sweet, delightful dog. On January 22, 2013, a very emotionally and physically fragile dog came to PAL in the arms of her rescuers. She had been pulled from a rural shelter that was at capacity. She was full of parasites and malnourished—literally wasting away. At this point she had no name, and as a foreshadowing of things to come, one of our staff members named her Hope. She was a funny looking dog, all ears and bones when she came to us. But as she started to put on weight, she retained the beautiful ears that are her signature characteristic. At first, Hope had a difficult time connecting with humans. She was wary of people, and who could blame her? With lots of love and patience, a new dog emerged—the dog Hope was meant to be. She was building confidence while learning to walk on a leash, interact with other dogs, and best of all, she was learning to trust people again. PAL’s dog behaviorist and staff put their heart and soul into Hope’s rehabilitation. That’s why everyone at PAL was ecstatic when, after just four months, Hope was adopted by an energetic young couple looking to add a dog to their home. They undoubtedly saw what we saw in Hope: a dog with a fierce appreciation for life and a heart full of giving, ready to love like only a rescue dog can love. I wish that was the happy ending to Hope’s story and we thought it was…until we got the call. For the second time in her life, Hope found herself at a crowded animal shelter, vulnerable and abandoned. What went wrong? How can someone have a four-year relationship with a dog and sever that tie so quickly? Why didn’t they call us so we could bring Hope back to PAL? We will never know the answer to these questions, so we focused on bringing Hope home. In fact, her journey home is what rekindled my faith in mankind. Facebook is an awesome animal rescue tool, so we messaged the amazing Judy Spooner, who deals in highly specialized animal transport. Amy reached out saying, “We have a dog in Virginia that needs come home to PAL ASAP.” Then we sat back and watched the magic happen as perfect strangers offered to help drive Hope every mile of the 10-hour journey home. Judy coordinated everything and Amy waited excitedly for Hope’s arrival in Okatie. Hope enjoyed her ride all snuggled in blankets. She grew close to “her human” during those hours in the car, only to say goodbye and walk into a building full of strange people and strange dogs. In the blink of an eye, Hope went from a family pet back to being alone. But she’s doing it, and we are here to fulfill the promise we made to Hope four years ago. PAL will be Hope’s home for now. We will, once again, love her and care for her until a new family walks into our adoption center and sees her for the beautiful soul she is. This is the essence of no-kill animal rescue: promising Hope that she will never lose her life due to lack of space in a human’s heart or in a shelter. With your help, PAL can save more abandoned, abused and neglected animals like Hope. These are lives worth saving. If you agree, join the No Kill movement today by visiting www.PalmettoAnimalLeague.org/lives-worth-saving. Donate $9 a month to save a pet’s life or make a one-time gift of $100. With Hope in mind, our goal is to save 1,000 lives. Today, you can save an animal’s life. To learn more about how you can help—to donate, volunteer or adopt a pet—visit palmettoanimalleague.org or call (843) 645-1725. Hawaii: Much More than a Beach!